Motti Oy was a famous restaurant in Helsinki and it was founded in 1941. The location of the âMottiâ told a lot, it was situated in the house on the white (right wing) . This legendary restaurant served a legendary main course, testicles of a sheep. In the restaurant customers could also enjoy the tastes of bear, beaver, squirrel, muskrat, willow ptarmigan, duck and hazel grouse. 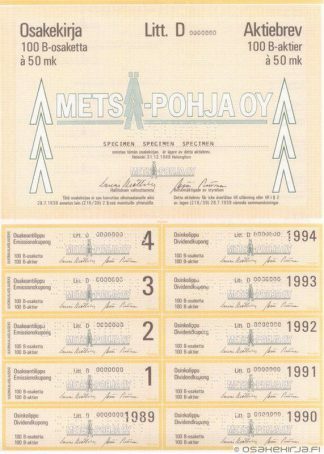 The restaurant has been closed and re-opened few times with a new menu, but the Motti Oy as a company was cancelled in 1997. 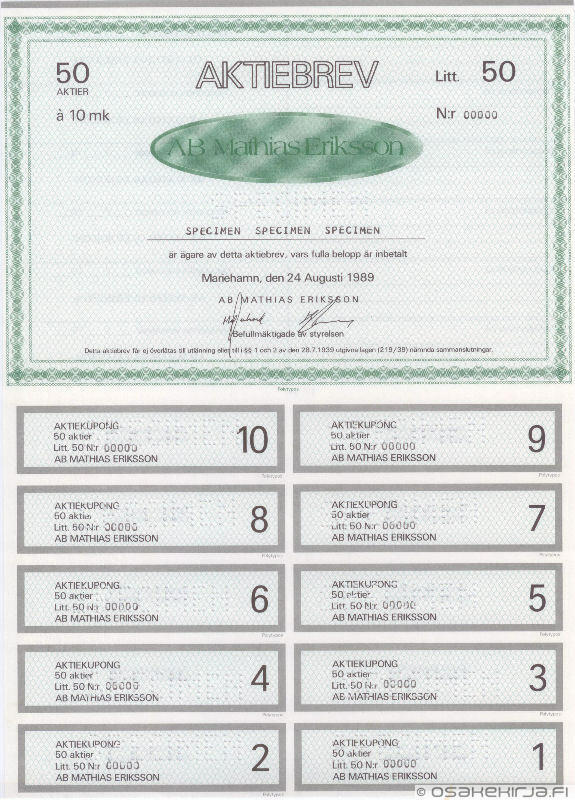 The picture of the share certificate is a little bit unusual. It immediately reminds the Finns of the Winter War in 1939 – 1940 where a small group of Finnish soldiers in the winter forest are on their way to the battle with their skies. In the Winter War the Finns developed a “motti tactic” which helped them to fight against the mighty Red Army. In the motti tactic the Soviet column was split into smaller groups, which the Finns could destroy i.e defuse the motti. 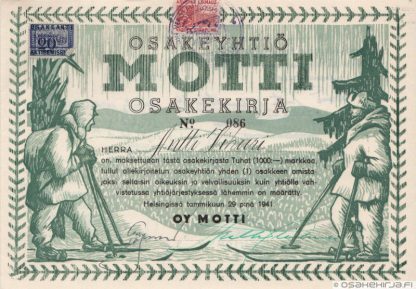 The most famous motti of the Winter War was Raatteentie, where the Finns destroyed the whole 44. Division of the Red Army. 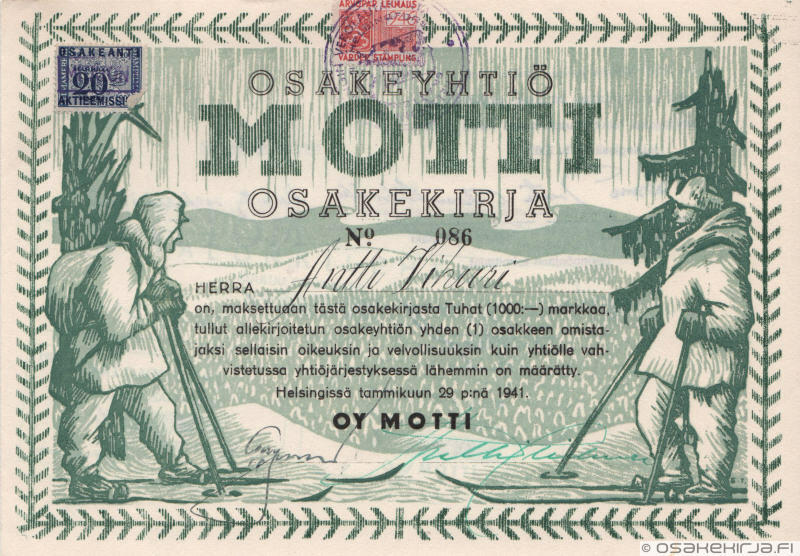 The word motti means also 1 m ³ of firewood. 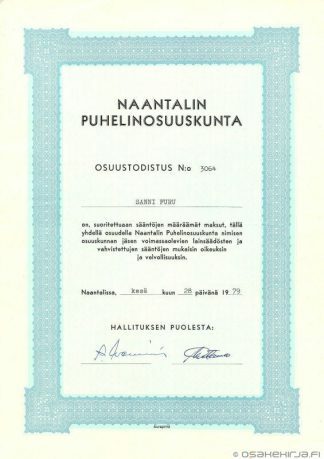 The picture of the share certificate is drawn by Mr Erkki Tanttu (1907-1985). He worked as a drawer of the Civil Guard Magazine ‘Hakkapeliitta’.